The #1 movie of the year proves that once again, dinosaurs rule the earth. #‎JurassicWorld is available NOW on 3D Blu-ray, Blu-ray, DVD, and Digital HD! The Jurassic World theme park lets guests experience the thrill of witnessing actual dinosaurs, but something ferocious lurks behind the park’s attractions – a genetically modified dinosaur with savage capabilities. When the massive creature escapes, chaos erupts across the island. 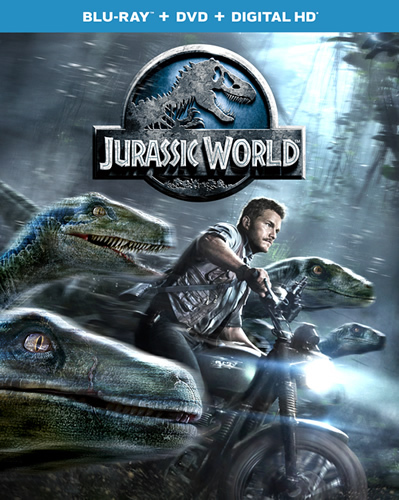 Now it’s up to Owen (Chris Pratt) and Claire (Bryce Dallas Howard) to save the park’s tourists from an all-out prehistoric assault. Scroll down to enter for a chance to win a copy! WELCOME TO JURASSIC WORLD: An in-depth take on the creation, look and feel of Jurassic World. Director Colin Trevorrow and Steven Spielberg discuss how the idea of the film came together and how the casting was decided with actors’ commentary on their roles and filming locations. JURASSIC WORLD: ALL-ACCESS PASS: Chris Pratt and Director Colin Trevorrow discuss key moments in the film, supported by behind-the-scenes footage and VFX breakdowns. INNOVATION CENTER TOUR WITH CHRIS PRATT: Chris Pratt gives a tour of the Innovation Center, a museum/exhibit, built just for the movie. JURASSIC’S CLOSEST SHAVES: Clips from all films in the franchise showing “near death” or extremely scary encounters with dinosaurs. DINOSAURS ROAM ONCE AGAIN: Behind the scenes look at the making of Jurassic World’s visual effects, how the dinosaurs came to life, and actors filmed scenes. CHRIS & COLIN TAKE ON THE WORLD: Chris Pratt and Colin Trevorrow (Director) interview each other and discuss Jurassic World as well as the other Jurassic Park movies. 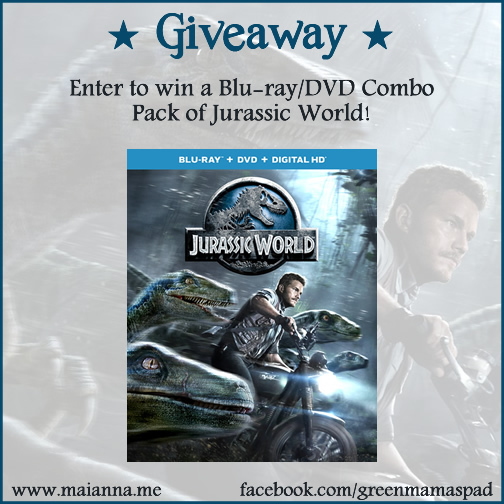 One 91) winner will receive a copy of Jurassic World in Blu-ray/DVD Combo Pack. Samples and prizing courtesy of Universal Pictures Home Entertainment. Open to US mailing addresses only. ARV $24.99. I have not seen this one yet. I always wait until they hit store shelves. We haven't seen this movie yet. My grandsons love dinosaurs and I think they would really enjoy it! My son wants to see this movie. He loves dinosaurs. We will watch this movie together. I have not seen the movie yet but the preview for it looks good. I'd like to watch it with my two teen sons. Thanks. I have seen it and loved it because how realistic the dinosaurs look. I have seen it and I thought it was a really fun and wild ride. Also loved the nods to the original film. I saw it at the Drive-in this summer and thought it was a lot of fun! Plus Chris Pratt always a win. I haven't seen it yet, but would love to watch it with my family. Please accept these fb share URLs. I misread the widget request and thought the URL of the facebook comment was asked for instead of the share URL. Here are the 3 shares I made on your facebook post. Thanks! I did see the movie! I liked when T-Rex came in and saved the day!